Do any of my fellow northerners remember wearing winter coats under their Halloween costumes at the insistence of their mothers? I certainly do; Halloween night seemed to be on the cusp of winter most years when I was a kid, and that trend continues. Even though we have freaky weather and fluctuating temps regularly here in Michigan – November days in the high 70s last year and a few more 70-degree days in February this year (the latter of which did feel quite wrong) – for some reason, they never seem to fall on Halloween. Those nights are more often than not cold and blustery and rainy; Mother Nature is really making the children in the Mitten work for that sweet, sweet candy! Today is no exception: the predicted high is in the mid-40s, with the possibility of a snow shower (noooooo) around mid-afternoon! It would definitely behoove the kiddos to load their bellies with this filling Spicy Turkey Chili before they head on out, because candy-grabbing in the cold ain’t easy! 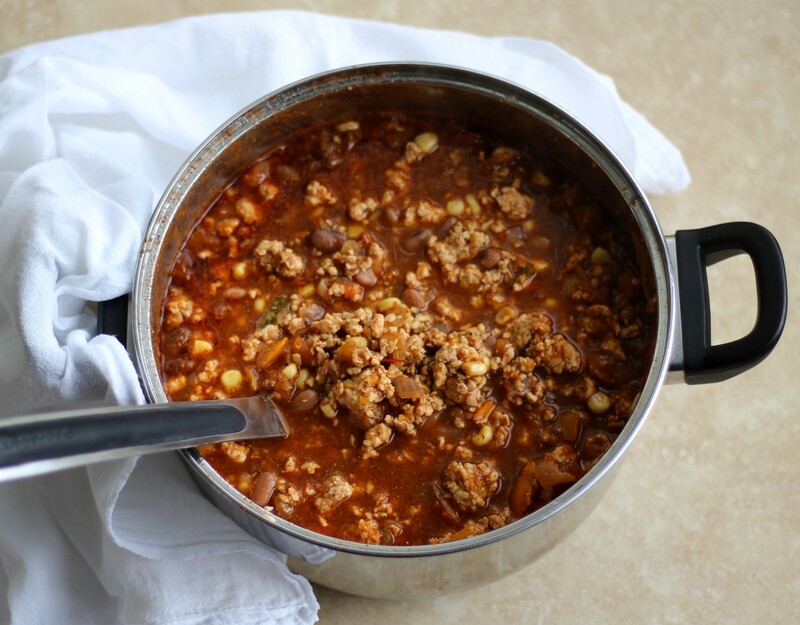 OK, maybe candy-grabbing is easy for an adorable eight-year-old dressed up like a unicorn and bundled into a snow jacket, but still – I’d take the excuse to load up on the Spicy Turkey Chili! Guys, I’m not generally a ground-turkey person, but I wanted to get out of my comfort zone and try a chili that was a little different for me. I’ve already done Quick and Dirty Beef and Black Bean Chili and Easy Spicy Sausage and Sweet Potato Chili recipes on this blog, and they are excellent, in my opinion, but why not try something new? And after my experience making Spicy Avocado Turkey Burgers with Sweet Potato Fries earlier this year, which were PHENOMENAL, I was like, let’s DO this, ground turkey! I went in full-force with the Spicy Turkey Chili-creating, going for a Southwestern-esque vibe, with corn kernels and diced orange bell pepper and jalapeño – plus pinto beans, tomatoes, onion, garlic, and plenty of spices, of course, because chili cannot be chili without that boatload of chili powder and the other savory goodies (in this case, cumin, coriander, cayenne, oregano, and of course, salt and pepper)! The result turned out quite nicely – very rich in flavor yet healthfully filling (but not in a boring way) with that lean turkey and those pinto beans and corn. When you eat Spicy Turkey Chili for dinner, you can come away knowing that you had a veggie-and-protein-packed, good-for-ya meal – making the inevitable candy-gorging that follows (at least on Halloween) that less guilt-inducing. I mean, you know I’m all for the whole-foods-focused, mindful eating, but Halloween is kind of made for candy-gorging. Something else I love about this Spicy Turkey Chili is the excuse to liberally load it with extras: toppings such as sour cream (or yogurt – I legit use plain, whole-milk yogurt in place of sour cream and find it to be a fine replacement), shredded cheese, diced jalapeño, tortilla strips, green onions, cornbread croutons . . . I could go on and on with the options! Because chili without toppings is good, but chili with toppings? That’s some whimsically-delicious stuff right there! 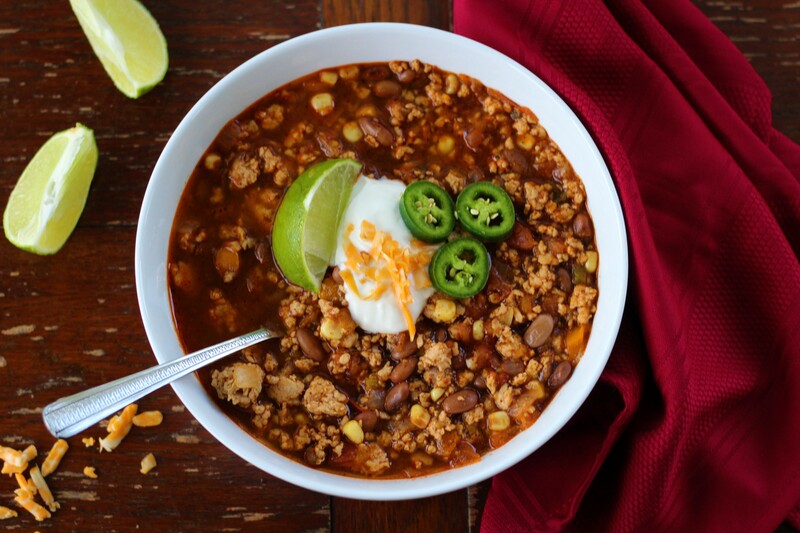 I love using a lime wedge as a garnish on this Spicy Turkey chili, too; it looks pretty, and the lime juice squeezed into the chili tastes fantastic. OK, enough with the talking – it’s on to the good part: the “on to the recipe!” part. So . . . ON TO THE RECIPE! Made with ground turkey and incorporating sweet bell pepper, corn, and jalapeño, this spicy chili is warming, hearty, healthful goodness. Extra toppings of your choice - sour cream, shredded cheese, lime wedges, tortilla strips, more diced jalapeño - add fun and flavor. Add the grapeseed oil to a large pot over medium-high heat. Add the ground turkey, breaking it up with a spoon into bite-sized pieces. Let cook for seven minutes, stirring frequently to ensure even cooking. Mix the garlic, onion, and jalapeño with the turkey and continue to sauté for an additional five minutes, or until turkey is cooked through. Next, add the chicken stock, tomatoes, beans, bell pepper, corn and spices. Bring to a boil, then reduce to a gently rolling simmer and let do its thing for 25 minutes. Then voilá! you have a beautiful, hearty, spicy, flavorful chili to enjoy!